There are currently 3 different Trangia models , manufactured in 3 different materials. The 25 series is the largest, designed for 3-4 people. The 27 series, designed for 1-2 people. The 28 series, or "the mini Trangia" as its commonly known, designed for the solo adventurer. The Trangia 25 & 27... 3 Materials, 16 Options. The list below shows 8 options for the different pan, kettle and material configurations available in the current Trangia 25-UL range. 25-3 no kettle, non-stick frying pan, 2 UL aluminium saucepans. 25-4 has kettle, non-stick frying pan, 2 UL aluminium saucepans. 25-5 no kettle, all non-stick.pans. 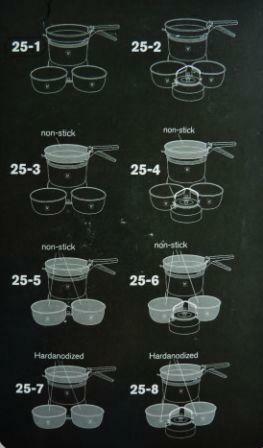 25-6 has kettle, all non-stick pans. 25-7 no kettle, all HA pans. 25-8 has kettle, all HA pans. 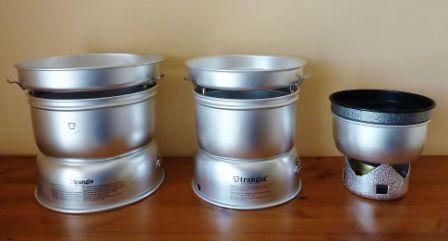 Trangia also make a gas burner attachment that fits both the 25 & 27 stoves. 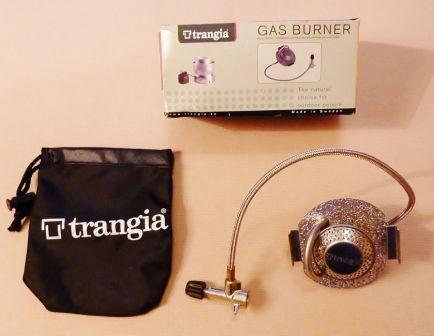 The Trangia gas burner fits inside the same opening as the brass spirit burner, the gas hose is then passed through the hole in the lower windshield and connected to a gas bottle. Aluminium 15cm non-stick frying pan, doubles as a pan lid. brass burner,simmering ring, screw top lid with rubber O-ring seal. From left to right, Trangia 25, Trangia 27, mini Trangia 28. So whatever outdoor stove you might require, whether its for a family camping trip, or a solo cycling tour around the world, you can be sure to find a Trangia model that suites your needs. 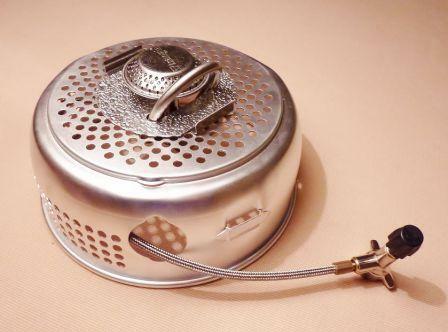 Have A Great Story or Review About Your Trangia ? Join In, let us know your experiences, or favourite Trangia model, write a review, send up to 4 photos, its really easy to do. Using my Trangia 27-5 (2012 production) in the North Carolina mountains, along Curtis Creek. Love my Trangias!